Also today: Wall Street shaken and stirred by Fed comment from left-field; Bernanke raises prospect of higher taxes; Geithner plays ping-pong ‘diplomacy’ over China’s yuan; BA and Iberia take to the skies together; Citigroup bosses kow-tow to the people; Russians, Europeans inaugurate Baltic gas pipe; Boeing flying lower; MasterCard to become master of the retail universe. 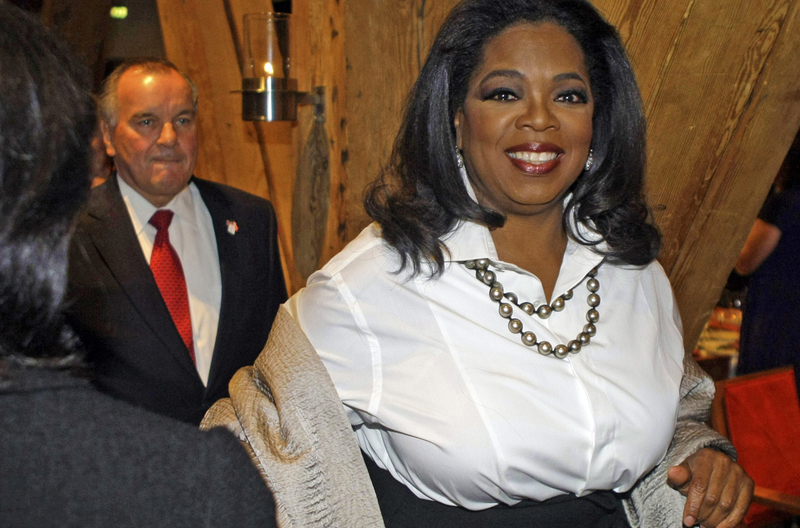 As part of her long goodbye, Oprah Winfrey is now marketing her new long hello, by pitching OWN, her forthcoming cable channel, to advertisers in New York. She’ll host her own (yes, that’s why it’s called OWN – Oprah Winfrey Network) prime-time interview show on the channel called Oprah’s Next Chapter. She’ll appear in two or three episodes a week, and move away from the daily talk show format she did for decades. Does that mean she’s getting a little older, and is cutting back the pace? The “Next Chapter” will premiere after her current talk show ends in September 2011. It’s designed to attract bigger audiences in prime-time and command premium prices from advertisers. That’s called rationalisation in business-speak. Photo: Reuters. Wall Street’s been shaken after a Federal Reserve official raised the possibility of higher interest rates. At the same time there are new signs that consumers are reluctant to spend again. The official said policy makers should consider lifting rates to 1% to ward off inflation, but he’s pretty much alone in this view for now, reports say. The Fed’s said it has no plans to raise interest rates anytime soon because inflation has remained quiet. But markets are still in the eye of the perfect storm, long after they collapsed. The prospect of too much inflation along with too little consumer spending is a tricky place to be. Federal Reserve chairman Ben Bernanke says Americans might have to swallow higher taxes or see dilutions in entitlements such as Medicare and Social Security, because huge budget deficits still threaten to suffocate economic growth. He says the US needs to demonstrate a strong commitment to fiscal responsibility at a time when the stock market has shot up, but tax revenues have fallen — and stimulus spending and rising social safety payments have put budget deficits at their highest levels since the end of World War II. No one quite knows how to proceed from here. It’s a bit like licking a finger and putting it in the wind. US treasury secretary Timothy Geithner is days away from a decision on whether to name China a currency manipulator. So his meeting with Chinese vice premier Wang Qishan in Beijing surely revolved around a possible yuan revaluation. But treasury reports of the meeting just trotted out the usual bumph, saying the two sides exchanged views on US-China economic relations and the global economic situation. The meeting took place in the VIP lounge of Beijing’s international airport, so it was what might be called a “flying visit”. Chinese President Hu Jintao is due to travel to Washington early next week for a nuclear security summit. But such is the heat over China’s currency that his trip coincides with the date Geithner is supposed to make his decision. Coincidence or not? British Airways and Spain’s Iberia have formalised a deal to create one of the world’s largest airline alliances, while across the pond, United Airlines and US Airways revived talks to merge operations and form what would be the second-largest American carrier. That speaks volumes for some of the problems global airlines have, as they slowly exit their worst crisis since 2001. The BA-Iberia merger still has to be approved by EU regulators. If given the OK, it will create a group with a combined market value of some $7.5 billion, 55% owned by BA shareholders. Airlines fly on pretty mean margins, with volatile price inputs such as fuel and food. Unfilled seats are worthless, while Internet ticketing has given bargain-hunting consumers far more pricing power. So, like the major car markers, it seems airlines are looking for economies of scale. But if the public doesn’t benefit, they will have failed. Two Citigroup executives have apologised to a federal committee for the billions of dollars of losses that nearly caused the bank to collapse at the epicentre of the Wall Street financial crisis. Charles Prince, Citigroup’s former chairman and CEO acknowledged that his management team, starting with himself, didn’t see the market collapse ahead of time, leading to millions of job losses, repossessions of countless homes, and a bailout involving some $45 billion of taxpayers’ money. Former secretary of the Treasury during the Clinton administration, Robert Rubin, a Citigroup board member and adviser, also showed some regret, but didn’t accept personal responsibility. He said nine different causes formed a toxic cocktail that “almost all of us” missed. But he claimed that the committee was seeking to apportion blame for “a level of granularity that no board would have with respect to the position on its books”. It makes one wonder who runs companies, anyway. The first pipe in the controversial Nord Stream gas pipeline from Russia to Germany has been laid under the Baltic Sea, with Russian President Dmitry Medvedev and German Chancellor Angela Merkel attending the ceremony near the Russian port of Vyborg. Russian gas monopoly Gazprom holds 51% of the venture, which passes through Russian, Finnish, Swedish and German waters. Nord Stream secured $5.4 billion to complete the first phase of the pipeline, with debt financing covering 70% of total project costs. Another 30% will come from project shareholders. Boeing delivered 11% fewer aircraft in the first quarter of 2010 as one model of jumbo-jet was discontinued and faulty seats provided by a Japanese supplier caused delays. Shipments in the period fell to 108 planes, from 121 planes a year earlier. Boeing has also scaled back full-year 2010 delivery plans, envisaging shipments to drop to some 460 aircraft from 481 last year. The Great Recession forced airlines to cancel or defer deliveries. But Boeing reckons that output will come back next year, and it’ll regain its title as the world’s largest aircraft manufacturer from European rival Airbus. MasterCard is entering the predictive online marketing business in partnership with an Internet company that specialises in personalised shopping. It’ll open a virtual mall called MasterCard Marketplace that monitors customer spending habits at thousands of retailers, and uses the data to help retailers customise their product offerings. But a shopping site run by a payment network rather than a retailer is sure to face hurdles. MasterCard ultimately gets to tell the so-called retail experts what to sell on the back of consumer statistics, and this also makes some privacy advocates nervous. And there’s no guarantee that shoppers will benefit from better prices. That definitely makes it a case of “virtual reality”.